Good grief. Didn’t the guy have the sense to wait until after being on patrol to secure his weapon before playing? Also, it’s a good thing it’s just play. Makes good practice. Because, by golly, if that paper cup under the front wheel were a landmine, KAH-BLOOEY!! Joking aside, I hope he made it back in one piece. And setting aside American Selfish Imperialism (or whatever the current PC term used to impugn the American superiority complex), I hope those kids are living for the better for their own country. 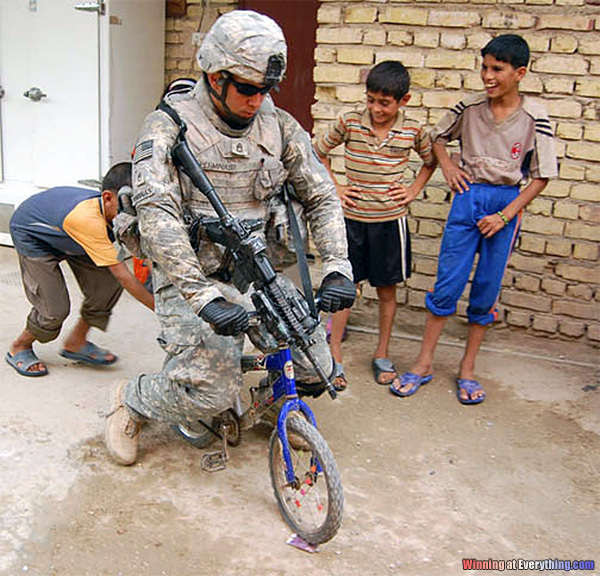 The budget cuts were especially harsh on the Pentagon’s motor pool. Make sure the Safety is on before popping a Wheelie.